Giovanni Visconti, who on Sunday won his first stage of his home Grand Tour, the Giro d’Italia, repeated the feat on Wednesday, riding solo to the finish in Stage 17. After riding an uphill time trial to win Stage Fifteen, he rode a flat time trial to win Stage Seventeen, attacking on the day’s only climb a steep Cat Four 24 km from the finish line. Visconti let the breakaway riders tire themselves, then watched while the chasers slowed. 19.5 km from the finish the Movistar rider made his move, quickly catching the remaining chasers and opening a gap of 30 seconds on the descent. Visconti managed to stay away despite the best efforts of the peloton, crossing the line 20 seconds ahead of the bunch. 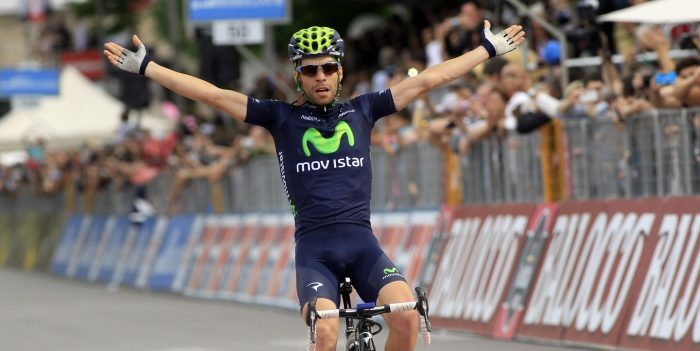 Not only was it his second Giro stage, it was three in a row for Movistar, as Beñat Intxausti took Stage Sixteen. “This is the proof that mental power is everything,” Visconti told Movistarteam.com . “The support of the team, the strength of my mind, the willingness to show I was back to the level I once had … To be honest, the Galibier resurrected me. It served to find myself again, to find confidence I thought I had lost forever, and to be able to play my chances into the race. “If someone had told me some days before I would be attacking on such a climb, I wouldn’t have believed them, but as I said, mental power changes everything. It was already a dream to win a stage in the Giro and I took two of them in just three days. “We knew it was a good stage for [Movistar sprinter Francesco] Ventoso or myself, but I found good legs into the climb and my heart screamed for giving it a shot. “I saw Lampre not pushing with everything they had so Pozzato could stay into the bunch and I saw a chance for me. “I waited until the last two kilometers, because I knew that the climb was less steep from that point, and went for Rubiano and Di Luca. If it went wrong, I still had time to help Fran into the volata (sprint.) But I was doing really, really strong into the flat, and with 5k remaining, I felt the win was mine. Not only was it Visconti’s second Giro stage, it was three in a row for Movistar, as Beñat Intxausti took Stage Sixteen. Altogether the team has casptured four stages; Alex Dowsett won the Stage Eight time trial as well. Stage Seventeen, 214 km from Caravaggio to Vicenza, was flat except for the sting in tis tail, a steep Cat Four climb 22 km from the finish. The climb at Crosara was only 5.3 km long, but it averaged seven percent—eight percent on the bottom, with a 12-percent ramp. The final few kilometers were only three percent, for any riders who could make it up the steep lower slopes after 190 km of riding. From the start, it was understood that the stage would be one for the sprinters; the only question seemed to be, would the pure sprinters like Mark Cavendish and Elia Viviani make it over the final steep climb, or would some of the lighter sprinters get a chance to go for glory? Cavendish cracked on the climb, as did many other riders; still it was assumed that the peloton would be able to reel in the breakaway and set up a bunch sprint. Giovanni Visconti’s inspired riding ruined all those plans. Four riders got away after five kilometers or racing. Miguel Rubiano (Androni Giocattoli,) Maxim Belkov (Katusha,) Gert Dockx (Lotto Belisol,) and Luke Durbridge (Orica GreenEdge) gained a maximum advantage of 4:40; mostly the peloton was content to let the gap hover around three minutes. Omega Pharma-Quickstep did most of the chasing, riding for Mark Cavendish. The breakaway riders didn’t give up easily, but the pace needed to stay away from the eager Omega squad took its toll. Maxim Belkkov cracked just outside the thirty-km mark; the other three forged ahead. Vini Fantini came the head of the peloton about 25 km out. Shortly after hitting the climb, tow Vini riders, Alessandro Proni and Danilo Di Luca, attacked the peloton. Dockx and Durbridge cracked at about that time; the bottom of the climb was too steep for their tired legs. Proni sat up after less than a kilometer; his role was to launch Di Luca, who caught Rubiano just after Visconti attacked. Rubiano tried to chase; Di Luca couldn’t. He has attacked in stage after stage in this Giro, and never quite seems to have enough to make good. Omega sent team mates back to pull Cavendish forward, but he had lost more than a minute on the climb and even with four riders helping couldn’t catch the peloton. Visconti opened a gap of 34 seconds halfway down the final descent, twelve kilometers from the finish. The last eight kilometers were flat, with a few bends near the end, but no real obstacles either for the Movistar rider or the pack pursuing him. Back in the peloton the attacks started ten km from the finish. Blanco’s Steven Kruijswijk and Euskaltel’s Jorge Azanza were the first to actually maintain a gap, followed by Lampre’s Rafal Majka. BMC took over the pace-setting and caught all the attackers 2.3 km from the finish, but all the infighting had distracted the peloton, and Visconti still had a 20 –second gap. The Movistar rider didn’t let up. He nearly crashed into a barrier on one of the narrow corners 1.6 km from the finish. He righted himself and pushed on; not until 200 meters from the finish line was he certain he had enough of a gap to be safe. Visconti sat up, zipped up his jersey, and crossed the line with his arms in the air, happy to have won his second stage and equally to have given his cycling career a second chance at life.